I recently used my SanDisk Cruzer USB flash drive as a rescue disk for my Chromebook while I was playing around in developer mode with crouton and ChrUbuntu in the event something went horribly wrong. Fortunately all went well and I wound up not needing to use it; however, today I went to throw some files on it and thought a simple reformat would do the trick. 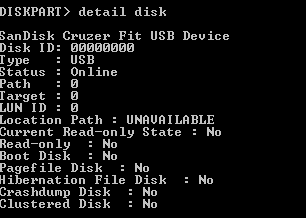 Once you have started diskpart run a list disk command and find your USB drive. My flash drive is 8GB so the 7644MB "Disk 1" is clearly it. Again, verify this is the correct disk or seek help from a geek friend!!! Once you have verified that you have selected the correct drive you can destroy all sectors on the disk using the diskpart's secure erase command "clean all" This will destroy ALL data on the disk and make it completely unrecoverable. This process will take some time to complete. My 8gb flash drive took ~15 minutes. Once this completes you can go into the normal windows disk management tool and create a new volume using your freshly emptied flash drive.